1. OBJECT OF THE GAME. 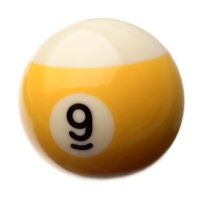 Nine Ball is played with nine object balls numbered one through nine and a cue ball. On each shot the first ball the cue ball contacts must be the lowest-numbered ball on the table, but the balls need not be pocketed in order. If a player pockets any ball on a legal shot, he remains at the table for another shot, and continues until he misses, fouls, or wins the game by pocketing the 9-ball. After a miss, the incoming player must shoot from the position left by the previous player, but after any foul the incoming player may start with the cue ball anywhere on the table. Players are not required to call any shot. a match ends when one of the players has won the required number of games. 4. CONTINUING PLAY. On the shot immediately following a legal break, the shooter may play a “push out.” (See Rule 5.). If the breaker pockets one or more balls on a legal break, he continues to shoot until he misses, fouls, or wins the game. If the player misses or fouls, the other player begins his inning and shoots until he misses, fouls, or wins. the game ends when the nine ball is pocketed on a legal shot, or the game is forfeited for a serious infraction of the rules. A player’s inning begins when it is legal for him to take a shot and ends at the end of a shot on which he misses, fouls or wins, or when he fouls between shots.